On Feb. 7, advocates for public education watched in disbelief as Vice President Pence broke a tie vote to confirm betsy DeVos as Secretary of Education, ignoring the voices of millions of Americans who had cried out against her nomination. DeVos, who has been dubbed “dangerously unqualified to run our public schools” and is the primary force behind a failed and underperforming charter school system in Michigan, left even her supporters scratching their heads with her rambling answers at her Senate hearing. She said she was “confused” about the federal law for students with disabilities, the Individuals with Disabilities Education Act. She could not articulate the difference between student growth and student proficiency. She refused to commit to enforcing the rights of students with disabilities in voucher and charter schools. And she refused to pledge not to cut public school funding in order to fund vouchers. Her confirmation was a bitter blow to the millions of advocates who work in, attend and support public education. 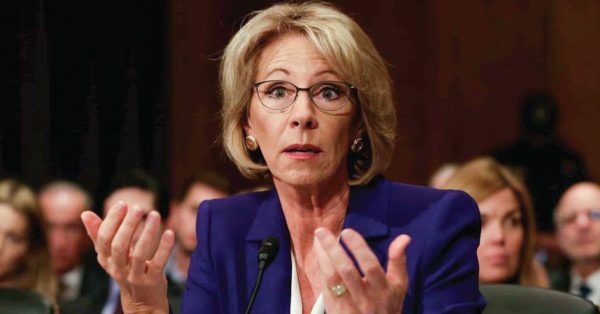 While she may be our education secretary, she certainly does not have a mandate, and we’re so proud of the over 1.1 million emails, 80,000+ phone calls, thunderous rallies, and countless creative actions by NEA members across the country to oppose her. No other nominee has garnered the level of bipartisan public opposition as Betsy DeVos, and that's thanks to you. Here are 6 things you can do right now to fight back in defense of public education. Thank Oregon Senators for voting 'No' on DeVos. We have not one, but two public education champions representing our state in the Senate. call Senator Wyden (202) 224-5244 and Senator Merkley (202) 224 3753 to thank them for spearheading the effort to derail deVos' confirmation and for voting 'No' on DeVos. Stay informed. Stay Active. Our resistance to the Trump and DeVos education agenda is more powerful when we have strength in numbers. Make sure to follow OEA on Facebook and Twitter. Already follow us? Ask a friend or family member. They might have a few billionaires on their side, but we have 3.1 million educators fighting on behalf of 50 million students nationwide on ours. Continue the great work you do every day. Secretary of Education Betsy DeVos has no classroom experience, which means our students are counting on your leadership now more than ever. Oregon has some of the highest quality public schools in the country thanks to you...keep up your incredible work! "Students, educators, parents, civil rights and special education advocates — along with millions of Americans — are speaking loud and clear: we are here to stay...we will protect public education. Every child — no matter what their zip-code, the color of their skin, or the money in their pockets — deserves a great public school.